Dentro da árvore gigante (Vordrassil), existe um túnel nas coordenadas 50.32 40.52, é só seguir até o final que você acha o NPC da missão (Lea Patapétrea). Inclusive colocaram uma foto da entrada do lugar aqui no wowhead, é um tunel marrom com totens de madeira dos lados. Boa sorte! The Dreamway entrance is under the big tree in respect to the map marker in case you have trouble locating it. Go in the Grizzlemaw tree, before you get to the bottom, to the north there is a cave passage way, head in and make a right and she is there standing by a big bear statue. If you're having trouble finding the flask moonwell water like I was, it's between the three trees at the northwest corner of the area. So the flask is very difficult and not mapped out on Beta. Dunno if this will be adjusted before live, but regardless, I'm here to help, since it took me 20 minutes to find myself. It's located at around (35,25 -- I believe hard to get proper map co-ords in Beta) which appears here in this screenshot: http://i.imgur.com/3O861dn.png on the edge of the pool of water. There is an entrance on the southern side of Grizzlemaw. She is inside of Grizzlemaw on the north side standing in front of a moonstone. You can fly inside of Grizzlemaw by the way, don't forget! Makes life a lot easier. The flask of moonwater was not showing for me and then all of sudden spawn three cups after about 10 minutes. I assume that maybe it was a phasing problem. Lea Stonepaw is INSIDE Grizzlemaw, underground. I looked for her above ground and was very confused until I remembered that Grizzlemaw goes underground. The previous quest, Dama da Garra, found Lea underground in Tel'Andu Barrow Den (cave entrance ). This "fill a flask" quest, Para as colinas, is NOT underground. You have to walk back to the surface, then head to a moonwell up a hill at . There are three VERY SMALL clickable pink flasks sitting on the edge of the moonwell, which you might not notice at first. Click one of those to complete the quest. Next, to find Lea's new location to turn in the quest, the quest marker shows coordinates , a big swirling portal in the Dreamgrove (on the surface, not underground). 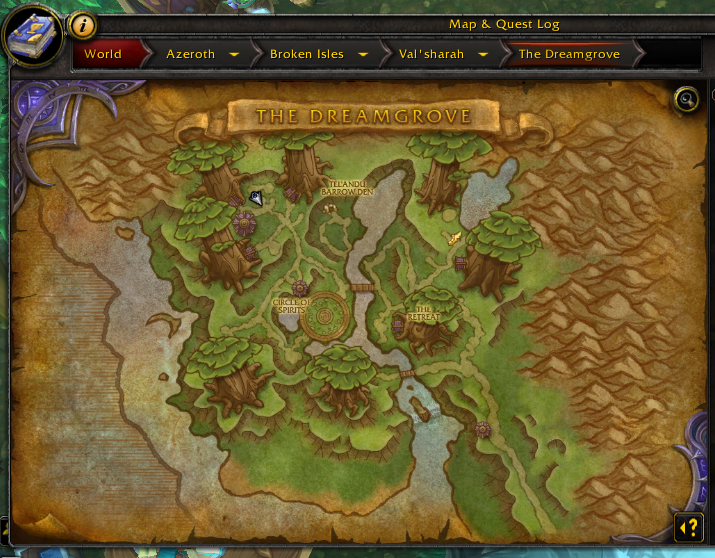 Go through that to go from the Dreamgrove to the Emerald Dreamway. Within the Emerald Dreamway, go through the Grizzly Hills portal, located at (the left of the two northernmost portals). In Grizzly Hills, there's a quest marker on the map at , but again this is deceptive - Lea is underground again! Fly up to the center of the huge tree (remember flying? stretch your wings!) at , the fly down about 20 feet off the ground, then fly northward into another burrow where you'll find Lea. Now breathe a sigh of relief that you had the good sense to look this quest up in Wowhead, instead of walking back and forth over the quest marks on the map, swearing at your computer monitor. Unless you did that for an hour until you thought of looking it up in Wowhead. The next quest, Oferenda caídas, is sometimes not completable without dropping and reaccepting it, so you might want to look that up too. At first, go to a moonwell (The Dreamgrove, 36.3 26.1) and pick up Água do Poço Lunar. Portal to Grizzly Hills can be found outside of The Dreamgrove, at the top of Emerald Dreamway zone. There you'll see the broken giant tree, fly inside and get in the entrance located in north wall. •	Accept the quest, Para as colinas, from Lea Patapétrea at coords 39.3, 18.8 (Tel'Andu Barrow Den at O Bosque Onírico). •	Exit the Tel'Andu Barrow Den and travel northwest to 36.0, 25.9. •	Click on the Frasco de Água do Poço Lunar. •	Travel east, to the Estrada Onírica Esmeralda portal, at coords 56.0, 21.7. •	Once in the Estrada Onírica Esmeralda, proceed west to the Serra Gris portal at 31.5, 26.0. •	Head south, into Grizzlemaw, to 50.3, 40.6, and follow the passageway to its end. If you are like me and decided to log off for some reason in the middle of this quest, and it would not allow you to turn in the quest because you don't have the Vial of Moonwell Water, then abandon the quest and start over. You will have to return to Lea Stonepaw in the bottom of the Tel'Andu Barrow Den in the Dream Grove again. Reacquire the quest. Then go and fetch a new vial of moon water and go back to the Grizzly Hills, complete the quest. You should be good from here. Encha um Frasco de Água do Poço Lunar e encontre Lea Patapétrea na Serra Gris. Dizem que um fragmento do espírito de Ursoc, a fúria e raiva dele, permaneceram dentro de suas garras depois de sua morte. Apenas aqueles que alcançaram a maestria da disciplina tem alguma chance de empunhá-las sem serem sobrecarregados pela fúria do lorde urso. Mas você não é <nenhum novato/nenhuma novata>, eu vejo isso claramente. Muito bem, pegue água do poço da lua na ponta norte do bosque e venha encontrar comigo. Estarei aguardando sua chegada dentro do toco quebrado de Vordrassil em Nortúndria. Você conseguiu a água do poço lunar? Ela é essencial para a nossa tarefa! Excelente! Precisaremos dessa água para entrar no Sonho Esmeralda, mas antes precisamos lidar com as barreiras mágicas que protegem as garras.